With Guns Ν’ Roses. Monday, Compton Terrace, Chandler. If someone devised a generational battle of the bands it would be hard to come up with a better-suited match than this. In one corner, the veteran Aerosmith. In the early ’80s, this New England quintet looked like hard-rock history. Singer Steve Tyler was recovering from a motorcycle accident, and the group’s other star, guitarist Joe Perry, was busy with his own project. But not only did Aerosmith get back together, the band’s current album, Permanent Vacation, is more varied and adventurous than anything it has done in years. In the other corner, the five brash upstarts of Guns N’ Roses. One of the most rapidly ascending hard-rock acts since Van Halen, the Los Angeles group is riding high on the strength of its debut album, Appetite for Destruction. Compared with this album’s blatant language, hedonism and frantic musical pace, Permanent Vacation is an exercise in sophistication. First out was Guns N’ Roses. It’s a fair assumption that, with Appetite for Destruction a recent No. 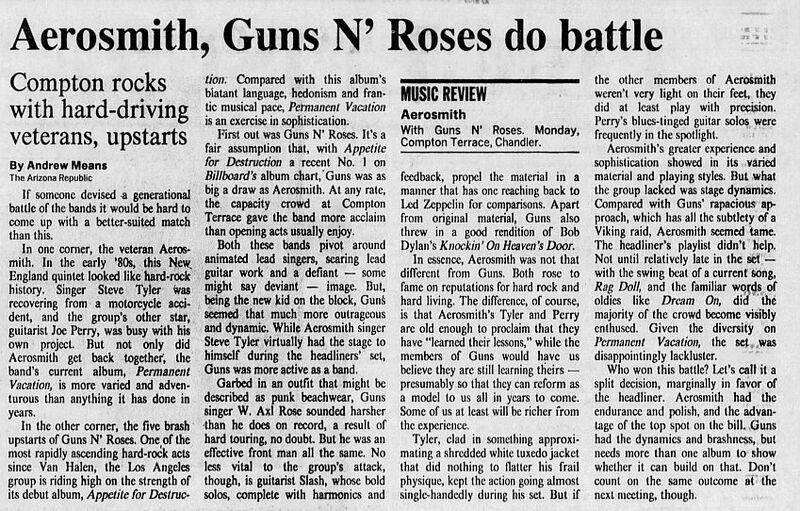 1 on Billboard's album chart, Guns was as big a draw as Aerosmith. At any rate, the capacity crowd at Compton Terrace gave the band more acclaim than opening acts usually enjoy. Both these bands pivot around animated lead singers, scaring lead guitar work and a defiant — some might say deviant — image. But, being the new kid on the block, Guns seemed that much more outrageous and dynamic. While Aerosmith singer Steve Tyler virtually had the stage to himself during the headliners’ set, Guns was more active as a band. Garbed in an outfit that might be described as punk beachwear, Guns singer W. Axl Rose sounded harsher than he does on record, a result of hard touring, no doubt. But he was an effective front man all the same. No less vital to the group’s attack, though, is guitarist Slash, whose bold solos, complete with harmonics and feedback, propel the material in a manner that has one reaching back to Led Zeppelin for comparisons. Apart from original material, Guns also threw in a good rendition of Bob Dylan’s Knockin' On Heaven's Door. In essence, Aerosmith was not that different from Guns. Both rose to fame on reputations for hard rock and hard living. The difference, of course, is that Aerosmith’s Tyler and Perry are old enough to proclaim that they have “learned their lessons,” while the members of Guns would have us believe they are still learning theirs — presumably so that they can reform as a model to us all in years to come. Some of us at least will be richer from the experience. Tyler, clad in something approximating a shredded white tuxedo jacket that did nothing to flatter his frail physique, kept the action going almost single-handedly during his set. But if the other members of Aerosmith weren’t very light on their feet, they did at least play with precision. Perry’s blues-tinged guitar solos were frequently in the spotlight. Aerosmith’s greater experience and sophistication showed in its varied material and playing styles. But what the group lacked was stage dynamics. Compared with Guns’ rapacious approach, which has all the subtlety of a Viking raid, Aerosmith seemed tame. The headliner’s playlist didn’t help. Not until relatively late in the set — with the swing beat of a current song, Rag Doll, and the familiar words of oldies like Dream On, did the majority of the crowd become visibly enthused. Given the diversity on Permanent Vacation, the set was disappointingly lackluster. Who won this battle? Let’s call it a split decision, marginally in favor of the headliner. Aerosmith had the endurance and polish, and the advantage of the top spot on the bill. Guns had the dynamics and brashness, but needs more than one album to show whether it can build on that. Don’t count on the same outcome at the next meeting, though.